This description of the Muruntau deposit is from "The geochemistry of gold and its deposits", R.W.Boyle, 1979. The Muruntau deposit is an en echelon system of thick, steeply dipping auriferous veins, intersected by stockworks of gently dipping gold-bearing quartz and quartz-sulphide stringers and veins. The host rocks are Palaeozoic calcareous siltstones, shales and various types of schists. Three stages of alteration and mineralization are recognized. The ore stage began with the intrusion of dykes of diverse compossition. Next followed the formation of latitudinal fractures and brecciation of the previously formed coarse-grained quartz veins and stringers. 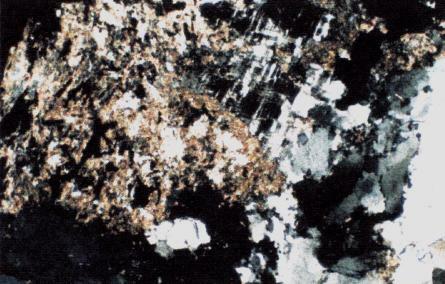 The second phase on mineralization was repeatedly interrupted by fracturing during which some quartz-arsenopyrite-pyrite stringers were formed, followed by the main period of pyrite-arsenopyrite mineralization. Chalcedony and rosette-like quartz aggregates were formed next, followed by the main quartz-gold-polymetallic pahse of ore deposition. Of the 5 samples provided, P9743 & P9754 were large enough to permit sampling as 2 seperate sub-samples to test for quartz sample homogeneity. Sample P9754, renumbered as 1496B was also analysed twice due to minor extraneous noises in the first analaysis (Run H1201). This duplicate analysis also serves to show the instrumental reproducibility - which is seen to be good. 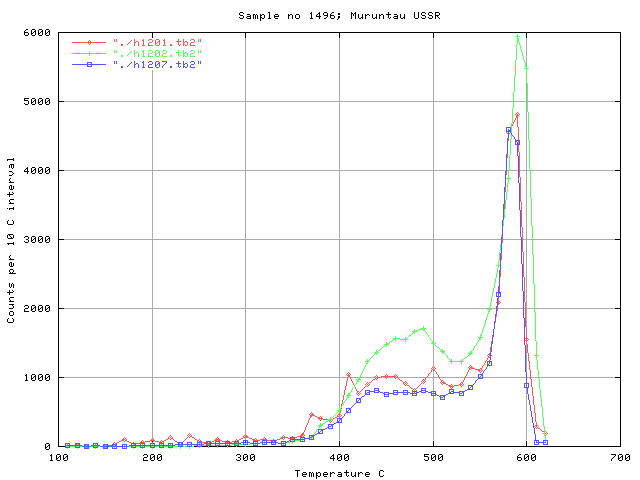 Sample P9754 gave very similar results for all of the 3 analyses on the 2 sub-samples, indicating the quatrtz is reasonably homogenous. However the 2 sub samples of P9743 showed significant differences, both in peak heights and in the temperature of the main decrepitation peak. This indicates the quartz is strongly zoned over small distances (a cm or two) in this case. The temperatures of the main decrepitation peak for each sample show that there are some subtle but discernable temperature variations in the sample set. 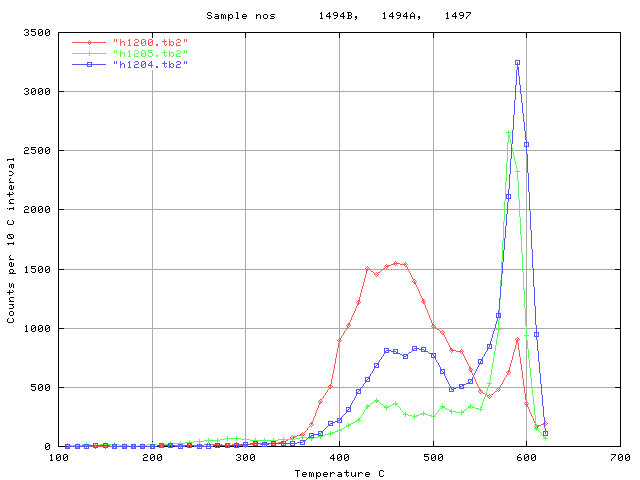 Sample P9745 has a peak at 420C; P9743 & P9754 at 440, 450C; P9742 & 9754 & P9769 at 460, 470C. These temperature changes are perhaps a sign of a system undergoing relatively calm fluctuations during the mineralizing events. None of the samples show any indication of CO2 content - at least to more than minor levels. 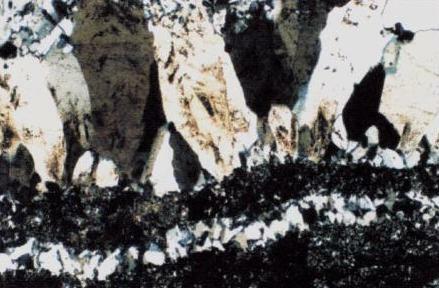 Inclusions with significant CO2 produce distinctive low temperature decrepitation peaks near 250-350 C. The system seems to have evolved slowly and continuously, unlike the Sunshine mine in Idaho, where multiple quartz vein systems in the one mine show a startlingly complex range of decrepitation. However, the complexity of this large mine cannot really be evaluated based on only 5 samples. Boyle reports that the Russians consider there are many (6??) stages of quartz formation at Muruntau. 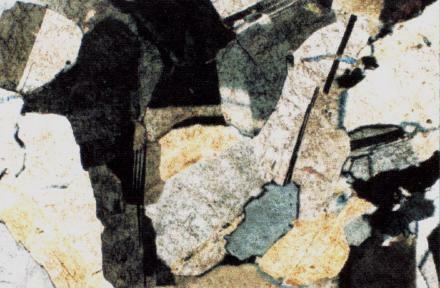 These few decrepitation samples suggest that the mineralization was the result of an ongoing, long process, perhaps with gradual cooling, rather than multiple diverse episodic quartz formation events. The 2 subsamples from P9743 (red and green) show significantly different decrepitation intensities and perhaps a small temperature difference, indicating that this quartz is inhomogenous and zoned at the centimetre scale. Sample P9769 (blue) has a distinctly higher temperature and shows no sign of CO2 rich inclusions despite the comments from the fluid inclusion microscopy. P9743: Deformed and fragmented vein cut by late carbonate veinlets. 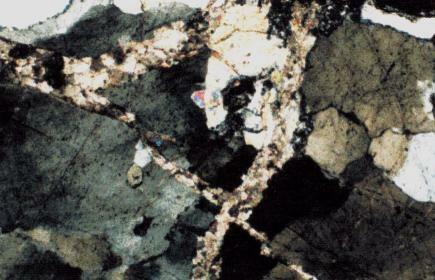 Quartz shows undulose extinction and is rimmed by fine-grained interstitial quartz aggregates. P9769: Coarse quartz-albite vein. There are few useable (for raman analysis) fluid inclusions in this sample. Fluid inclusions are rounded to irregular in shape. Variable liquid to vapour ratios. 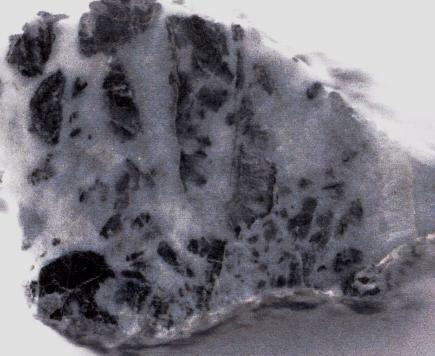 Three inclusions contained high concentrations of CH4 and 15 - 20 mol% of CO2. The A (green) and B (red and blue) subsamples of P9754 are quite similar and indicate the original quartz sample is reasonably homogenous. The 2 analyses of P9754B are almost identical, with minor problems due to instrumental artifacts. These 2 analyses show that instrument reprioducibility is far better than even variations within this nearly homogenous quartz. The fluid inclusions were claimed to contain high CO2 contents. 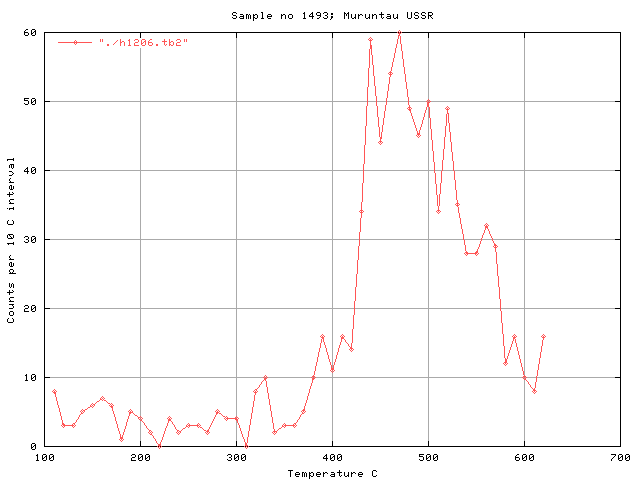 But there is no low temperature decrepitation typical of such CO2. If CO2 is present, it must be at quite low pressures, indicating a very high level emplacement, which is unexpected. P9754: Coarse grained quartz vein in siliceous sediment. Quartz has undulose extinction and embayed ragged margins. Cut by fracture-filling carbonate. Fluid inclusions are rounded to irregular in shape. Variable liquid to vapour ratios. 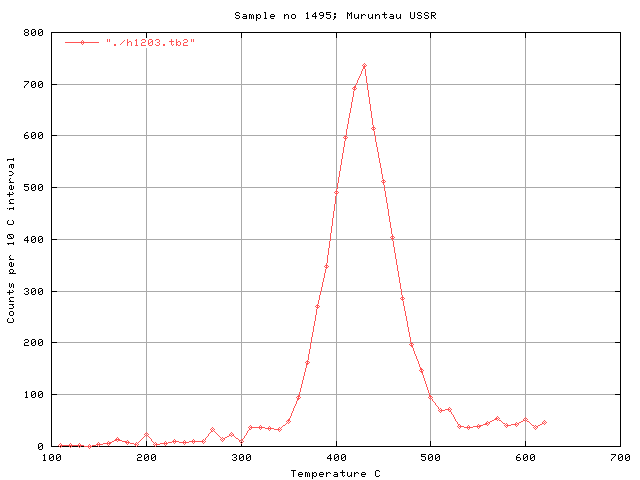 "Fairly consistent" gas ratio of 89-95 mol% CO2, 0-3 mol% N2 and 3-9 mol% CH4 and traces of H2S (Raman analysis). Sample P9742 has remarkably low decrepitation intensity - essentially none, and this may be due to the intense recrystallisation noted in the microscopy. P9742: Three generations of vein. 1) Deformed, coarse grained, 2) Small stringers. 3) Recrystallised, coarse, plumose in cavities & veins.